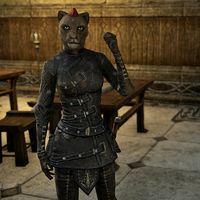 Ilara is a Khajiit student found at the College of Aldmeri Propriety. Malangwe: "Tuck in your tail, soldier!" Ilara: "This one did as you asked. Please!" Malangwe: "Talking back? Maybe you need more time in the Cave? ... Ah. We have company. We'll continue this later." "Ilara can't go to the Cave! Not again!" "Saltspray Cave. It's just north of campus, towards the beach. They throw us in to correct our behavior." "Cruelty for the sake of cruelty, this one thinks. We don't get enough food. They mock us, beat us. We're supposed to be training for the Thalmor, but they treat us like slaves." Piromir: "Get up, Ilara. You are going to the Cave." Ilara: "The Cave? Why? She didn't do anything! Don't put Ilara in there!" Malangwe: "Special order from Tanion. Maybe this'll keep your shortie friend from getting out of line. Baham might make it out of here. You're just dead weight, cat." Ilara: "Why did you throw her in here? She did nothing wrong!" Tanion: "You don't belong here, cat. None of you belong here!" "She just wants to get out of here." It's all right. Tanion is dead. "They were going to kill Ilara. Just for being what she is. How... how can I be anything other than Khajiit?" It's over now. Let's get out of here. Thank you. This one is sure Baham is worried." "She's just so glad to be out of that horrid place. Thank you. Thank you for what you did for Ilara." After the quest is completed, she'll say, "Thank you. One day, perhaps Ilara's dreams will return. Return to normal." This page was last modified on 23 March 2018, at 10:51.